The principal altar of the Manila Cathedral is a tribute to Our Lady of the Immaculate Conception. The frontispiece of this high altar is the impressive work of the German artist Toni Fiedler. The Blessed Mother is depicted as being paid homage to by the Patriarchs of the Old Testament on one side, and the saints of Christendom on the other. The background shows the Original Sin and the manger in Bethlehem, signifying redemption through the incarnation of the Word. 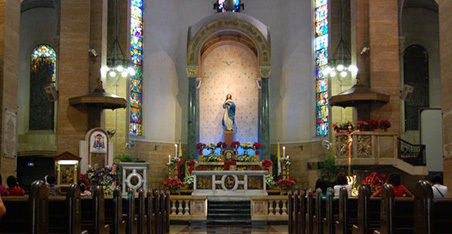 The altar is supported by pillars representing Saints Catherine Laboure, Lawrence of Brindisi, Pius V, and Leo IX – four saints known for their pious devotion to the mystery of the Immaculate Conception. The tabernacle of the main altar, which is also Fiedler’s work, represents Mary in the act of receiving the Body and Blood of her Son Jesus from the hands of the Beloved Apostle St. John. the Immaculate Conception, which the Italian Enzo Assenza crafted based on Esteban Murillo’s painting. The Marian image, also designed by Fiedler, is protected by a canopy or baldachino showing beautiful angels venerating the Cross. The column capitals of this canopy portray the olive, cypress, and plane trees to which Mary has been compared according to Liturgy.